The Flying Mile, our South side mid-mountain lift, and the Expo Express, our North side mid-mountain lift, will be in service on Saturday for a total of 9 open lifts. To the delight of our freestyle fans, the Progression snow park, at the bottom of the Alpine run, will also be open as of this weekend. With the park’s 2 jumps and 5 rails/ box, we’re up to 15 total stations with the 8 already available on the North side. 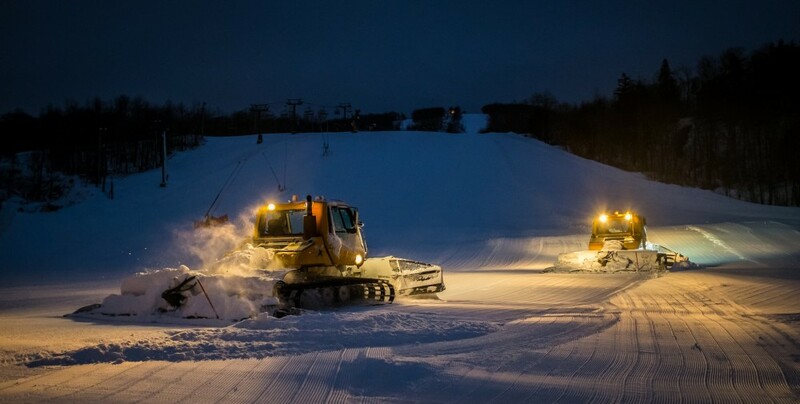 Snow conditions are looking good; we expect to deliver more than 33 tracks throughout the weekend. The small storm we had this week gave a nice texture to the gliding surface and a few more inches of snow are still to come in the next couple of days. As usual, the operations team will be on the lookout to take advantage of all snow making opportunities and deliver new skiable terrain as soon as possible. A few events are taking place at the mountain Saturday, including the Super Demo Day. Open to all, you will have the chance to try some of the best skis and snowboards on the market. Do not miss this first of four scheduled demos this winter, always at the base of the South side. As in previous years, we invite our members to a nice get-together with Tremblant’s Executive Team. If you have a season pass with privileges or are a member of the Club des Montagnards, you are invited to a breakfast with us at the Grand Manitou, Saturday, December 13, 2014, at 7 pm 45. Holders of Buissonnière passes are also invited.